NEW YORK — For holders of bond funds, the Federal Reserve is providing a reminder that even those buttoned-down, conservative investments carry some risk. 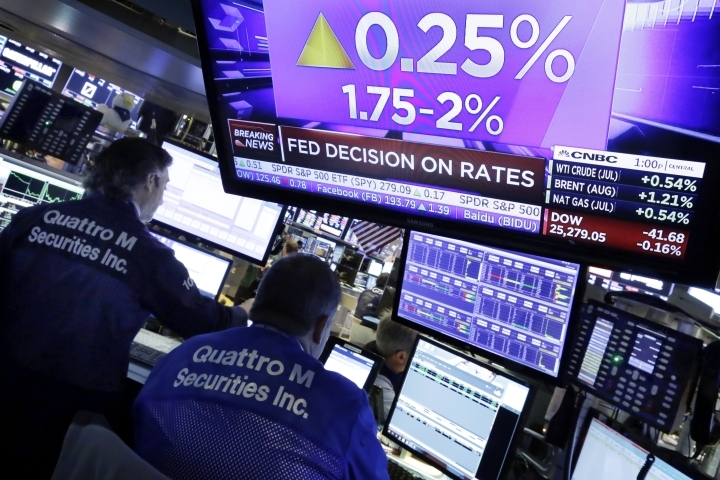 Bond prices fall as interest rates rise, and the Fed raised its benchmark interest rate by another quarter of a percentage point Wednesday. The central bank also said it may raise rates two more times this year, a faster pace than it indicated a few months ago. With interest rates on the rise, the prices of bonds siting in funds' portfolios could drop because they suddenly look less attractive than newly issued bonds. Even if the fund doesn't sell the bond, and thereby avoids locking in the paper loss, its share price will drop. The largest bond mutual fund dipped 0.1 percent on Wednesday and has lost 2.4 percent so far this year. Bond funds have grown in popularity as aging populations seek a steady source of income with less risk than stocks. Bond funds that track indexes are particularly in favor because they carry significantly lower fees than managed funds and have a solid track record. One way to measure how much pain a bond fund will incur is by looking at something called its "duration." This number shows roughly how big a loss to expect if interest rates climb by one percentage point. The duration for the Bloomberg Barclays U.S. Aggregate index, which is the benchmark for some of the biggest bond funds and ETFs, hit 6.1 at the end of the first quarter. It's been marching steadily higher after sitting at 5.3 five years ago and 4.4 a decade earlier, according to the Investment Company Institute. But not every bond fund is seeing its potential riskiness increase as much. "The only ones that are lengthening are index funds, the others are fairly flat," said Sean Collins, chief economist at the Investment Company Institute. While index funds that track the Bloomberg Barclays U.S. Aggregate have seen their durations extend by 15 percent over the last five years, the average taxable bond mutual fund's has moved up to just 4.1 from 3.9. Narrow the focus to only high-quality, investment-grade bond funds, and the average duration has remained flat at 3. It's a result of how bond fund managers have adjusted their portfolios due to worries about rising rates. To protect themselves, many have stuck with shorter-term bonds, which typically get hurt less by rising rates than the longer-term bonds that dominate the broadest indexes. That means investors who ditched their actively managed bond funds for index bond funds in recent years may also have raised their susceptibility to a rise in rates. Last year, investors poured $210 billion into taxable bond funds that track indexes, versus $179 billion for actively managed ones, according to Morningstar. Of course, some analysts have been warning for years that interest rates were set to skyrocket and send bond funds to big losses, only to see rates stay low. Aging populations around the world are hungry for income, and their resultant demand for bonds has helped to keep prices high and rates low. Plus, not all bond index funds have the same amount of duration. Investors can control how much interest-rate risk they want by moving to short-term bond index funds. Interest rates have been climbing fairly steadily since last autumn, and the yield on the 10-year Treasury sat at 2.98 percent on Wednesday. Economists at Deutsche Bank expect it to hit 3.25 percent by the end of the year. Goldman Sachs strategists predict the yield will hit 3.60 percent by the end of next year. If rates rise in a gradual way, bond index funds could still come out OK. Even though prices would be dropping for the bonds in their portfolios, they could eventually offset those losses with the additional income they'd be getting after buying higher-yielding, newly issued bonds. In the meantime, bond index funds will likely continue to have the advantage when it comes to fees. Bond index funds kept just $7 of every $10,000 invested last year to cover their expenses, compared with $55 for actively managed bond funds, according to the Investment Company Institute. So, bond index funds will still hold onto their benefits, even as rates rise, but their risks will also grow. It's just another reminder that no investment is perfect, or perfectly safe.